Celebrate New Years Eve with your 25 closest acquaintances! Invite your family and friends out to your place for a fun filled night on New Years Eve. Make sure there are decorations for everyone, browse through our Party Kits for a wide variety of party supplies. Our kits include a mixture of hats, tiaras, necklaces, and more! We have a wide variety of style choices for you party. If you are looking for a more sophisticated Black and White look, check out our popular New Year Tymes Assortment. Or if you want something with a little more personality and color, we also have a popular Rainbow Blast New Year Assortment which has 5 different color accessories. No matter what style and kit you chose, we will have other New Years Eve Party Supplies to match your awesome New Years Party Kit! An assortment for 25 is the perfect size New Years kit for an in-home New Years Eve party. With approximately a dozen hats and a dozen tiaras you will have enough New Years party favors for just about everyone. The real benefit for buying a New Years Eve assortment for 25 is that your are instantly done with shopping for party supplies. All of the New Years Eve party favors you need for 25 people are already in one box. Some of our most popular New Years Party Kits are the Chicago Swing New Years Kit for 25 because the classic black and white theme will match any New Years party theme you may be using and will go great with upscale or formal attire your guests may be wearing. 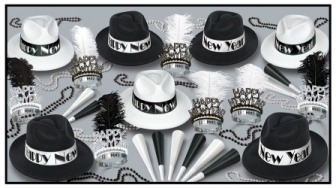 Each party kit includes enough black and white fedoras, plumed tiaras, and party beads and noisemaker horns to keep 25 adults entertained through the New Years festivities. If you would like a New Year's Party Kit with some amazing colors pick up the Rainbow Blast New Years Party Kit that includes brightly colored top hats, rainbow tiaras, and brightly colored plastic leis and horns. Throw in some additional streamers and this New Years party kit for 25 will make every party feel like it is in Time Square. All of these New Years Party Kits are packed in boxes so they are easy to transport to wherever you New Years party may be. If you are responsible for providing the party favors for your friends New Years Eve party, there is no better way than to pick up one if these all-in-one party kits and then bring it to the party with you. It's fast, easy, and makes you look like the party hero. If you are looking for a classy New Years Party Kit but don't have a very big budget, we suggest the Sparkling Silver New Years Party Kit. Made of black and silver foil paper hats and tiaras, this party kit looks great but doesn't cost a lot of money. The silver foil horns will match everything from a cocktail dress and a tux, all the way down to a t-shirt a jeans. You wouldn't ride a motorcycle without a helmet, so don't throw a New Years eve party without picking up some New Years Party Kits. Check out all of our New Years Party Supplies and Decorations.